The Travelling Lindfields: The Alaska Marine Highway - Ketchikan, Wrangell, Petersburg and the Wrangell Narrows. Thirty-seven hours from Bellingham we make our first stop at Ketchikan. We have been in Alaskan waters for about two hours. They are no different from Canadian waters - mile upon mile (kilometre upon kilometre in Canada) of spruce tree lined shores. Nothing else - no towns, no houses, no signs of life at all save for the ubiquitous bald eagles perched high in the trees scanning for prey. I am so ready for some variety, even Ketchikan comes as a welcome relief. An influx of cruise ships has transformed the village into a faux-early Alaskan frontier town but at least it provides a break from the spruce trees. 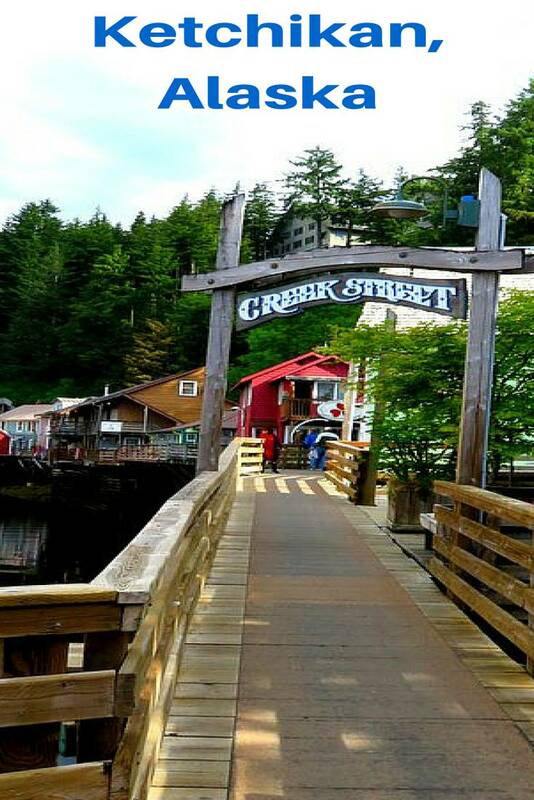 As the first port of call in Alaska, cruise ships heading north have designated Ketchikan a 'must see' attraction. Consequently we share the town with five humongous floating cities. This house with totem poles out the front was one of the very few structures to break the monotony of the shoreline. Ketchikan has a permanent population of 9,000 people. Each cruise ship carries several thousand passengers. Think about it - on any given day tourists can outnumber the locals by almost two to one. Little wonder the town feels like Disneyland on steroids. Even so, we have five wonderful hours there. The ferry docks a couple of miles from the town centre. After thirteen hours flying from Sydney, a three and a half hour lay-over at L.A. airport, another three hour flight to Seattle followed by thirty-seven hours on the ferry we feel like we have been in transit for weeks. It is 7 am and we are among the first to disembark. We briefly consider taking the bus to town then opt to walk. We practically sprint we are so happy to stretch our legs. I have a list of 'must see' sights including Creek St and the totem poles at Saxman Native Village. The village turns out to be several miles out of town but Creek St is a lot of fun. The shop fronts are restored to look like they did in the early days. Behind the facades, jewelry and trinket shops feed the tourists' insatiable thirst for souvenirs. I am far from immune. Soon enough I am the proud owner of a pair of cheap but colourful earrings. The salesman says they are Swarovsky Crystal. I'm pretty sure they are glass. Briefly I possess a matching pendant but it is lost within hours. It may have fallen from my handbag when I pulled out my camera. If you read this and find it - it is yours. We have two more stops before Juneau, where we will disembark. Both Wrangell and Petersburgh are tiny and unaffected by the cruise ships. The behemoths are too big to navigate the Wrangell Narrows and must sail this section of the Inside Passage in deeper waters. The Narrows are a highlight of our voyage. The ferry requires five feet of water below the keel. Consequently we can navigate the Narrows only in the few hours either side of high tide. We are warned when we dock, briefly, at Wrangell not to stray too far from the ship. The Captain cannot risk missing the tide and will wait for no-one. David and I elect to stay on board. Don, the ferry's spokesman, and source of all information aboard tells us about the boy scouts who sell garnets from a stall in the car park at Wrangell across from the dock. Sure enough as the ferry ties up a group of boys can be seen setting up a tressle table just where Don has indicated. "They were granted the concession of a gem mine by a former mayor of Wrangell", Don continues. "I know nothing about the quality but do your negotiating quickly. The price goes up as our departure time gets closer." The ferry plots a course through the Narrows as if playing a game of nautical ping pong. The navigation markers are numbered and the Captain knows just how many degrees he must turn the ship as each marker lines up with a pole on our bow, He has a special certification just for this hour and a half stretch of water. As he negotiates the vessel from one marker to the next Don gives us a running commentary. The only safe time to enter the narrows is just as the tide begins to run against us. If we leave Wrangell late and the tide turns it will push the ferry too fast to navigate the channel. Two crewmen are positioned on the bow. No doubt they are providing a last line of warning against unexpected obstacles and shallow waters. Channel markers in the Wrangell Narrows. After an hour and a half we are through and pulling into the port of Petersburg. The ferry docks too far from the town centre to make sightseeing worthwhile in the forty-five minutes we are allowed ashore. Early tomorrow morning we will arrive at our destination of Juneau, the Capital of Alaska. The ferry will continue without us on to Haines and Skagway before returning south. How beautiful. I have read good thinks about Ketchikan. My boss just returned from a trip to Alaska and he was commenting about how he didn't see houses or civilization for miles. He was right about the lack of civilisation. It is miles and miles of nothing but spruce trees. So sweet seeing these pictures of my old stomping grounds. I lived in Ketchikan and Juneau for about six years long ago and loved every minute. Such an incredible place, people and of course, environment. Found you through the linkup. As you can see we loved Ketchikan. We left the ferry system for a few days in Juneau. We were blown away by the Mendenhall Glacier - just stunning. Even Disneyland can be great fun if you are in the right frame of mind. I enjoyed reading your post about Alaska. I've been planning to go for a long time now, but I'm still debating if I should do a cruise or go by plane. There is so much I'd like to visit there. Thanks for joining me for #TheWeeklyPostcard. Honestly there isn't a huge amount to see, except spruce trees, until you get pretty close to Juneau. If you enjoy cruising go for it but I was a bit disappointed in the scenery. Whatever you do, if you are visiting the panhandle don't miss Glacier Bay National Park. It is stunning. Most of the cruise ships go there but the Alaska Marine Highway ferries don't. You can take a day tour from Juneau but it is a long day so we flew over it. For me it was the highlight of the trip. I think the brochures concentrate on the best bits and it takes quite a few days of boring bits to get there. We didn't go north of Haines and I'm pretty sure some of the cruise ships do. Maybe it improves. It has been fun but I'm not sure I would go back. Travelling the Alaskan Marine Highway on a ferry was one of the highlights of our 2006 journey through the USA and Canada. We got on a ferry with our truck camper in Prince Rupert, Canada and got off in Juneau for a few days before continuing to Haines. I really enjoyed visiting Ketchikan with you. It sounds like you did much the same trip as us, except we got on the ferry further south in Bellingham. Did you drive further north after Haines? We turned around at Whitehorse. This was our first trip through the Americas - 2006-09 - and the furthest North we drove was to about 20Km beyond the Arctic Circle in The Yukon. Wow - You are so much more adventuresome than us. I would love to see the Arctic Circle. I have not yet cruised the Inside Passage but would prefer to do it on the maritime ferry rather than a big ship. There is a sense of adventure and real life you get aboard the ferry which may be missing on a cruise ship. One of the highlights was all the interesting people we met - both locals going home and people on holiday. If you do go - you need to book early to get a cabin. Your ferry trip sounds far more interesting that seeing the country by cruise ship. Cruising is something that does not appeal to me and you have just confirmed that, if I am ever to see Alaska, I will fly into Juneau. You can always fly to Juneau and then take the Alaska Marine ferry system from there to see places like Sitka. That way you would get a feel for the connection this part of Alaska has with the sea. Great to see Katchikan from a tourist side - the narrow creek side is colorful (hop they have a street on the other side of the houses!) We're following a series of Alaskan Troopers on National Georaphic TV channel - the beauty of this state is incredible! Haha. I don't think they did have. They just backed up onto the hillside. They reminded me a bit of Palafittos in Sth America. We stayed in one on the Island of Chiloe once and it was incredible watching the tide go in and out. Beautiful photos! I would love to spend several months exploring Alaska some day. It is a great place - but you do have to like spruce trees a bit - lol. What majestic beauty! Hope we have the opportunity to visit Alaska one day. Thanks for whetting our appetite. We're hoping to visit Alaska and Ketchikan next summer, probably by boat. I didn't realize that navigating the Narrows was so exciting, although perhaps I should have deduced it from the name. Their are entire books written about it but it did help a lot that there was an Alaska Marine Highway guy talking us through how precise the navigation needed to be. Wow, how beautiful! There's something magical about the snow capped mountains! I agree. I love seeing snow on our travels. We got to see tons of it when we flew over Glacier Bay National Park. 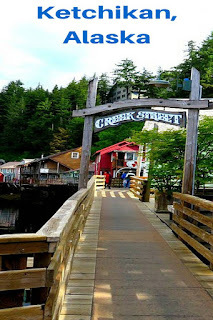 Wonderful photos from your visit to Ketchikan. It is a neat little city. Our cruise ship stopped there, not long enough to see much. The ferry sounds like a neat way to see Alaska! Enjoy your day! You probably saw more than you think. It is quite small. I couldn't count the number of times David and I have thought we needed to go back to a place only to find when we did that there was not a lot more to see. Of course, if you really want to soak up somewhere we find you have to stay a couple of days at least. Don't know which photos I like best. Alaska is such a stunning country. I absolutely agree with you about Alaska being stunning. What smart entrepreneur kids - putting up the prices closer to leaving time. Still have to smile about the tourist outnumbering the island people 2 to 1. Alaska looks so pretty, that walk after being on a plane and travelling for so long, would have been so good! The feeling of freedom we had on the walk into Ketchikan was just fantastic. I'm not really concerned about the necklace. I've still got the earrings and they were what I really wanted. Your adventure in Alaska is one a lot of people want to duplicate. So beautiful. I am going to be one of those cruisers next month so I found your article especially interesting!! Ha - boy scouts are entrepreneurial little boys huh! Such great adventures you are having in Alaska! You are right about them being entrepreneurs. I read an article which says they tell the tourists they are saving up to go to college but in fact they spend the money on new bikes and other toys - good luck to them. Lynn, your posts are always so very entertaining. I always feel like I'm right there with ya'll. Keep up the good work, and by all means keep taking me along. Hi J. You have branched out from Google+! Thank you for the kind words.